EghtesadOnline: Major Iranian steelmakers exported a total of 1.9 million tons of semi-finished and finished steel products during the first quarter of the current fiscal year (March 21-June 21) to register a 10% growth year-on-year, according to data released by Iranian Mines and Mining Industries Development and Renovation Organization. The companies shipped 627,875 tons of steel during the third month of the year, Khordad (May 22-June 21), which indicates an 11% YOY drop after two months of uninterrupted growth. The data used here are preliminary statistics offered by IMIDRO on Iran's top-scale producers and lack details on most private producers' shipments. A more detailed report is usually published by Iran Steel Producers Association a few weeks later. A foreign currency shock and the looming return of sanctions on Iran seem to be what sapped exports of their strength in Khordad, Financial Tribune reported. Having lost 30% of its value against the US dollar in the last fiscal year (March 2017-18), the rial kept its losing trend up until April 9 as it was unofficially being traded at 62,000 against the greenback. Steelmakers were euphoric as a further devaluing currency would have supercharged their exports. Yet everything changed on April 10 as the government pinned the USD rate at 42,000 rials and forced all metal exporters to sell their export revenues to banks at the predetermined rate. Even local sales on Iran Mercantile Exchange are based on the official government rate. On top of that, sanctions on Iran's sales, supply or trade of steel are set to kick in on August 6, after a 90-day mark since US President Donald Trump pulled out of the 2015 Iran nuclear deal. Reports by Metal Bulletin show that a large number of foreign buyers are avoiding Iranian steel, while some are attracted to the cheaper price tag. All in all, this does seem to be the start of Iranian steel industry's gaze turning inward, as anyone watching the surging IME demand in Iran would tell you. Khouzestan Steel Company exported 764,296 tons of slab, bloom and billet in Q1, registering a 6% decline YOY, while still managing to keep its top spot. Slab exports had the lion’s share of KSC's exports with 352,412 tons, going up 35% YOY. Bloom exports came next with 211,590 tons down 52% YOY, followed by billet with 200,294 tons, surging 87% YOY. KSC's Khordad performance better highlighted its retreat from the exports front. Its shipments dropped 22% YOY to 273,014 tons. Bloom exports were hit worst with a 66% downturn to 63,063 tons, as billet was also down 3% to 67,313 tons. The steelmaker, located in the southwestern Khuzestan Province, exports to over a dozen countries. About half of the exports go to the Middle East and North Africa region. Other major export destinations are located in the Far East and Americas. KSC exported a record high of 2.76 million tons in the last fiscal year (ended March 20, 2018), growing 34% YOY. Mobarakeh Steel Company went against the grain and was the only exporter to post a significant uptick in shipments for both Q1 and Khordad. MSC shipped 342,101 tons of hot- and cold-rolled, acid-washed, tin-plated, coated, checkered and galvanized flat steel during the three-month period, indicating an overall YOY growth of 98%. Hot-rolled coil shipments, the company's main output, had the highest YOY growth with 992% to 161,328 tons. Other exports such as pre-painted coils and slabs had minimal growths of 19% and 20% to 556 and 165,454 tons respectively. What boosted MSC's Q1 performance was primarily the eye-catching uptick in the third month of the year. It shipped 100,191 tons in Khordad to rise 200% YOY. HRC and slab shipments were both up 568% and 125% YOY respectively. The giant steelmaker was last year's second largest exporter with 1.29 million tons of shipments, down 16% compared to the year before. Together with its subsidiaries, Mobarakeh Steel is the largest flat producer in the Middle East and North Africa region, accounting for 1% of Iran’s GDP. 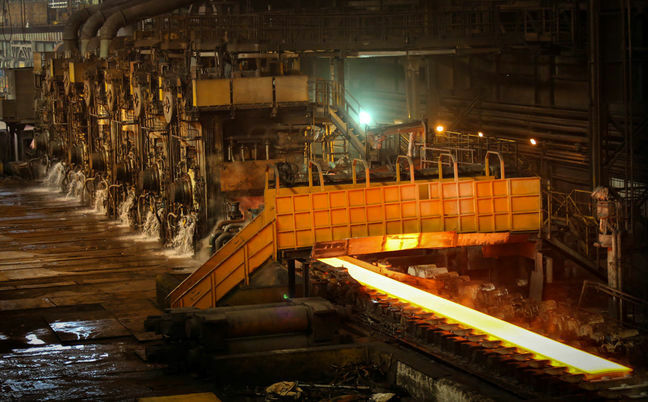 Esfahan Steel Company was the third biggest exporter during the period with 254,609 tons of beam, rebar, coils and other products shipped overseas, down 30% YOY. Rebar made up 44,634 tons of ESCO’s overall exports in Q1, dropping 20% YOY. It was followed by beam and coil with 24,299 tons and 14,221 tons respectively. Beam shipments were down 26% YOY, while coil exports grew 4%. Steel products listed as "others" made up 171,455 tons of all the exports, down 34% YOY. ESCO ended last year with an 80% uptick in exports to 1.15 million tons, making it the third largest exporter. South Kaveh Steel Company came next with 226,000 tons of billets to post a 60% YOY upsurge in Q1 shipments. Hormozgan Steel Company took the next rank with 188,682 tons of slabs shipped, up 12% YOY. Khorasan Steel Company was next with 31,444 tons of rebar exported, down 30% YOY. Iran Alloy Steel Company followed with 29,132 tons of rebar shipments, down 9% YOY. Khouzestan Oxin Steel Company was next with 12,868 tons of plates, up 308% YOY.